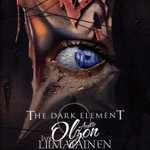 Share the post "Album review: THE DARK ELEMENT (featuring Anette Olzon & Jani Liimatainen)"
After Anette Olzon’s unceremonious departure from Nightwish in 2012 she took stock, brushed herself down, and fashioned the beginnings of a solo career. ‘Shine’ was released in 2014 and was one of my favourite albums, described by GRTR!’s Pete Whalley as “one of the best pop/rock albums you’ll hear this year”. It seems that her solo career may have faltered somewhat, perhaps not knowing which direction to take – a subject we explored in more depth in a contemporaneous interview. ‘Shine’ was an excellent slice of female fronted contemporary pop rock but perhaps alienating those who enjoyed her tenure in Nightwish. Since that solo album Olzon has actually changed focus and undertaken a university degree in order to pursue a career in nursing, but she evidently is keeping a toe in typically unpredictable and precarious musical waters. She’s most recently guested on the title track of Power Quest’s latest album but also in 2017 she came together with Jani Liimatainen (one time founder-member of symphonic power metallers Sonata Arctica) and seems to have rediscovered her symphonic pop metal mojo. The results of their collaboration, released in November 2017, sadly escaped the end of year ‘Best of’ attention and not just at GRTR! The title track and ‘My Sweet Mystery’ set the tone for a symphonic pop rollercoaster ride, summed up by the flighty choruses, pounding rhythms and uplifting keyboard orchestration. It will surely appeal to those who like Delain, or maybe the likes of Within Temptation, After Forever or Secret Sphere. And of course there are going to be elements of Sonata Arctica’s power metal and Liimatainen’s band Cain’s Offering. The album is pretty much one paced but avoids a descent to the cheesy or semi-Eurovision that sometimes affects this genre. Only time will tell if this ear-candy onslaught will stand the test of time. This could be ABBA if they had ever done a symphonic pop metal album. When the pace does slacken, a power ballad like ‘Someone You Used To Know’ taps into that rich vein of Scandinavian top notch songwriting with the emphasis on a torch vocal and highly melodic stylings. Amongst the other standouts ‘I Cannot Raise The Dead’ is hugely catchy whilst ‘Halo’ and ‘The Ghost And The Reaper’ should convince that this album is worthy of your greater attention. This entry was posted in ALBUM REVIEWS, ALBUM REVIEWS (Mobile), All Posts and tagged album, Anette Olzon, Jani Liimatainen, Nightwish, pop metal, review, Sonata Arctica, symphonic metal, symphonic rock, The Dark Element. Bookmark the permalink.